"Are you joking right now?" Nikki Bella is furious with Brie Bella on Wednesday's Total Divas season six finale. On the episode, Brie asks Daniel Bryan to put in a good word for Nikki at WWE to try to get her a spot at SummerSlam. But when she tells Nikki what she did, her sister is extremely upset with her. That's when Nikki asks her if she's joking, "You really said that? I never asked you to do that for me though. I don't need people's help to get on the show, it's my own hard work and talent that gets me on the show." Brie asks her sister, "You think I'm taking away your hard work? Oh I'm sorry that I was f--king trying to get you a job." Watch the Total Divas clip above to see the sisters argue and see Nikki tell Brie she's "really disappointed" in her! Stephanie Nicole Garcia-Colace (born November 21, 1983) is an American professional wrestler, actress, and model signed to WWE under the ring name Nikki Bella, performing on the SmackDown brand. She is currently inactive due to injury. In June 2007, Bella signed with World Wrestling Entertainment (WWE) and was assigned to developmental territory Florida Championship Wrestling (FCW) alongside her twin sister Brie Bella, forming the duo The Bella Twins. She made her debut on SmackDown in November 2008. Bella is a two-time WWE Divas Champion. Her second reign is recognized as the longest in the title's history at 301 days. Bella ranked No. 1 in Pro Wrestling Illustrated's Female 50 in November 2015 and was named Diva of the Year by Rolling Stone in December 2015. She also won the award for Choice Female Athlete alongside her sister at the Teen Choice Awards in 2016. 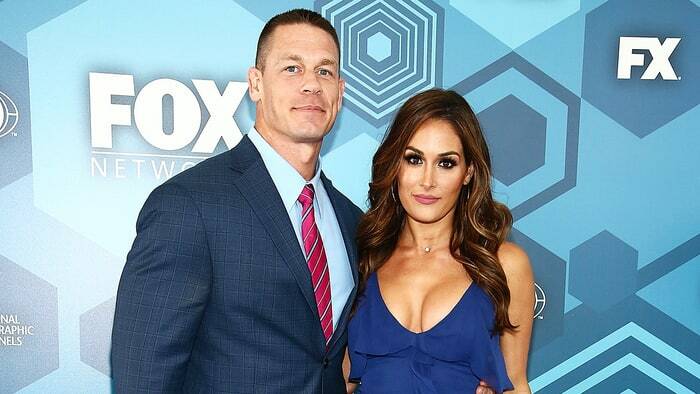 Nikki Bella Still ‘Spending Nights�..
John Cena ‘Heartbroken’ Over Nikki..
John Cena: Why He Reportedly Forced Ni..